Writing, as everyone knows, is solitary work. Whatever an editor does involves some kind of contact with lonely writers. A big reward for me in editing the current issue of Against the Grain and writing the article “The Business of Academic Bookselling…and Buying” was, in fact, the chance to interrupt the solitude of our contributors, some of them old friends, and through them revisit the early years of my career. Among those friends, I’ve known Rick Lugg longest. I joined this industry in 1985 when I walked in the door of the company, then called, Yankee Book Peddler. Rick had been there a few years and progressed from the warehouse to ‘Bibliographer,’ which was my new job too. The Bibliographers—six of us, I think—sat together in a quiet room where we worked through stacks of new books. When we were done the staff who’d carried the books into our room would carry them out. They’d key our work into a crude automated system, which crashed all the time. When it was up, the system created orders and notification slips for customers with approval plans. The slips were multi-part paper forms and our bursting machine, like the order system, failed every so often. Among my earliest and most vivid memories of Rick are times when the machine went down and he spent entire days separating forms in long accordion strips by hand, tearing each one along the perforation connecting it to the next. That added up to thousands of slips. 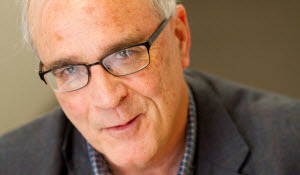 The look I recall on Rick’s face was a special mix of anger dulled by resignation, leading to a trancelike state within which he’d reached a space where it was possible to think, with diamond clarity, about how things could get better. Things did get better. As I’ve heard Rick say, “I spent the first half of my career putting books into libraries.” He’s right: We put a lot of books into libraries. The vehicle carrying many books into those libraries was the approval plan. Once our systems stopped crashing we got pretty good at approval plans. They were still going strong when Rick left the company, around 2000, to begin a consulting business with his wife Ruth Fischer. Eventually they started a new consulting company, Sustainable Collection Services (SCS), now a part of OCLC, which was based on a fact not widely acknowledged at that point—many of the books we put onto library shelves stayed right there, unused. SCS developed what was a sort of approval plan profile in reverse, with categories meant to identify low-usage books that could be readily accessed or acquired by other means, if needed by a user. Administrators had their eye on space taken up by seldom-used books, which could be deaccessioned or sent to storage. 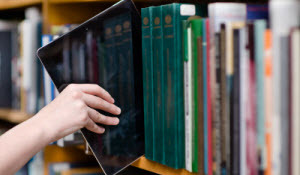 Budgets faced more scrutiny after 2008 and money could instead be spent on all kinds of higher-use electronic resources. “Now I’m spending this half of my career,” Rick jokes, “taking books out.” Things have definitely gotten better for him. As for me, I’m still putting them in but putting them in less often through approval plans. While my duties have changed, libraries have also changed. Over the years I’ve had something to do with creating a hundred approval plans or more. The last time I had a personal hand in one though was in 2011 at Case Western University. Stephanie Church was one of the librarians we worked with at Case. A few weeks ago I saw Stephanie again when I visited Cleveland and enjoyed a tour of Case’s Kelvin Smith Library, one of the most patron-friendly libraries I’ve ever seen. The “Best Buy table,” an attractive display of laptops, cameras, recorders, tablets, and other devices available for loan, was one sign of that, among many others (These devices were once kept out of sight, in drawers). While books have hardly gone away at Case, their approval plan has. Stephanie’s study of book usage—not to mention today’s budget climate—as she wrote for ATG, has moved the library toward DDA models of book acquisition. I didn’t know Carol Cramer prior to working on the issue. But I did know her library, since I was the field rep in the early 1990s when Wake Forest first set up an approval plan. This one, unlike Case, is still going today but reduced in scope. I recall a series of meetings with highly skeptical members of the teaching faculty, who controlled book selection (and budgets) in that era, while creating the approval plan with one of Carol’s predecessors. Now things have reversed course at Wake Forest, and like at Case Western, the library has again put book selection (if not the budget) back into the hands of faculty, and now other users too, through DDA. Another approval plan I remember from the 1990s was at the University of South Florida. The USF plan might have been the largest I worked with then. The university was relatively new and on the rise. One way to boost visibility was to add as many books to the collection as possible. I was only too happy to help, of course. This ATG issue had its origin in a panel at last year’s Charleston Conference, where USF’s Monica Metz-Wiseman (who could not join us in the issue) described their large DDA program. That program might well be based in part upon my old approval plan profile. As with Case and Wake, the profile’s been repurposed to fit a new economy, like an aging factory brought back to life by architects who saved the framework but turned the building into something new. Libraries of course aren’t the only ones who’ve had to change. A great many of the books we put into libraries were imprinted with the name Routledge. Routledge & Kegan Paul, actually, was the name on the title page in 1985 when I walked in that door. Routledge is a venerable name in academic publishing, but the companies it has been associated with have changed constantly over the nineteenth, twentieth, and now twenty-first century. One kind of change, as Alan Jarvis reports in ATG, has been growth through the acquisition of other publishers. Some approval plans, when I began, were referred to as “publisher-based.” We had to know our imprints. Lawrence Erlbaum, M.E. Sharpe, Gower - those are just a few of the imprints that moved to Routledge. Parent company Taylor & Francis has been an innovator among academic publishers and after reading Alan’s contribution, I have a deeper understanding of how T&F has maintained its success. When I’d visit libraries to review approval plan profiles, I would prepare and bring with me all kinds of reports, notes and files. Once at the University of Michigan, Mark Sandler said to me something like, “You know we don’t do a lot of fine selecting here. We just tell the trucks to back up to the loading dock.” Mark wasn’t trying to hurt my feelings, but he was saying that an intricately refined profile was less important there than the mass acquisition of new books. Michigan, as a great research library, still runs a big approval plan. But even in Ann Arbor approval plans aren’t quite as central as they once were. Ebook packages have a lot to do with that, but it was Mark himself who helped create ways for libraries to have access to more books than any of us once would have imagined - projects like Early English Books Online, the Text Creation Partnership, Hathi Trust, and Google Books. A few weeks ago I had dinner with Mark and his wife in Nashville, where I now live. Mark had recently retired and the evening was great fun. Over his career as a librarian, he said, there weren’t many people he didn’t enjoy (and those few, he noted, because of that really stuck out). He liked working with just about everyone he met in this profession. These editing duties have helped to show me that when my day comes, I’ll be able to say much the same thing. Read more about academic publishing, approval plans and DDA in the April issue of Against the Grain. Whatever an editor does involves some kind of contact with lonely writers. A big reward for me in editing the current issue of Against the Grain (ATG) and writing the article “The Business of Academic Bookselling…and Buying” was, in fact, the chance to interrupt the solitude of our contributors, some of them old friends, and through them revisit the early years of my career. The vehicle carrying many books into those libraries was the approval plan. Once our systems stopped crashing we got pretty good at approval plans. They were still going strong when Rick left the company, around 2000, to begin a consulting business with his wife Ruth Fischer. Eventually, they started a new consulting company, Sustainable Collection Services (SCS), now a part of OCLC, which was based on a fact not widely acknowledged at that point—many of the books we put onto library shelves stayed right there, unused. Over the years, I’ve had something to do with creating a hundred approval plans or more. The last time I had a personal hand in one though was in 2011 at Case Western University. Stephanie Church was one of the librarians we worked with at Case. I didn’t know Carol Cramer prior to working on the issue. But I did know her library since I was the field rep in the early 1990s when Wake Forest first set up an approval plan. This one, unlike Case, is still going today but reduced in scope. I recall a series of meetings with highly skeptical members of the teaching faculty, who controlled book selection (and budgets) in that era while creating the approval plan with one of Carol’s predecessors. Now things have reversed course at Wake Forest, and like at Case Western, the library has again put book selection (if not the budget) back into the hands of faculty, and now other users too, through DDA. Libraries, of course, aren’t the only ones who’ve had to change. 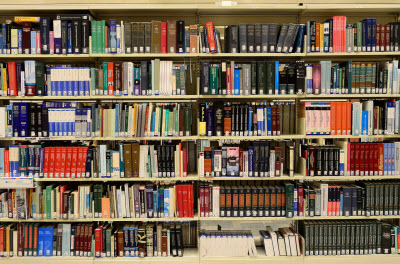 A great many of the books we put into libraries were imprinted with the name Routledge. Routledge & Kegan Paul, actually, was the name on the title page in 1985 when I walked in that door. Routledge is a venerable name in academic publishing, but the companies it has been associated with have changed constantly over the nineteenth, twentieth, and now twenty-first century. One kind of change, as Alan Jarvis reports in ATG, has been growth through the acquisition of other publishers. Some approval plans, when I began, were referred to as “publisher-based.” We had to know our imprints. Lawrence Erlbaum, M.E. Sharpe, Gower—those are just a few of the imprints that moved to Routledge. Parent company Taylor & Francis has been an innovator among academic publishers and after reading Alan’s contribution, I have a deeper understanding of how T&F has maintained its success. When I’d visit libraries to review approval plan profiles, I would prepare and bring with me all kinds of reports, notes, and files. Once at the University of Michigan, Mark Sandler said to me something like, “You know we don’t do a lot of fine selecting here. We just tell the trucks to back up to the loading dock.” Mark wasn’t trying to hurt my feelings, but he was saying that an intricately refined profile was less important there than the mass acquisition of new books. Michigan, as a great research library, still runs a big approval plan. 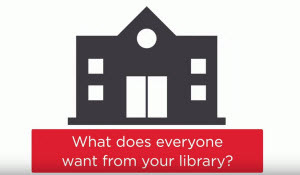 What do students want from their library experience?